14 mins "Undeniable" Shale Slowdown? Amid fears that regulators may move to tighten safety rules for crude oil shipments from North Dakota after the fiery derailment last week of an oil train, Warren Buffett’s Berkshire Hathaway has announced plans to acquire the pipeline development unit of Philips 66. Berkshire Hathaway, the owner of the BNSF oil train that derailed last Monday, has reportedly made a deal to acquire the Phillips Specialty Products unit of Phillips 66, which develops polymers to maximize pipeline flow potential, in a $1.4 billion stock deal. "I have long been impressed by the strength of the Phillips 66 business portfolio," the Wall Street Journal quoted Buffett as saying, adding that he viewed the specialty unit as a "high-quality business with consistently strong financial performance." The specific number of shares will be determined by the share price at the deal's closing, which is expected in the first half of this year. Analysts at the Motley Fool have suggested that the acquisition is Buffett’s way of “tipping his hand as to where he and Berkshire Hathaway might go elephant hunting next.” The suggestion is that acquiring Phillips 66’s special unit is both an investment in oil and gas transport by pipeline and a longer bet on increased US domestic consumption. The fear is that the North Dakota derailment, which follows on the Quebec train disaster, will see a tightening of regulations on crude oil shipments from North Dakota, but this could also apply to pipelines, which have had their own disasters. On 30 December, a mile-long train carrying crude oil derailed outside of the North Dakota town of Casselton, bursting into flames and erupting into a series of explosion, prompting the temporary evacuation of nearby residents. This was the fourth major derailment of crude oil transport trains in six months. The most devastating was the explosion in Quebec of a runaway train carrying North Dakota crude in July last year, killing 47 people. Federal regulators have suggested that the variety of crude from North Dakota’s shale formations is potentially more flammable and more dangerous to ship by rail than crude from other areas. This may lead to stricter rules on railcar construction, which could further raise the costs of transporting crude by rail. In turn, this could exacerbate the shortage of capacity for moving oil to refineries. The Bakken accounts for more than 10% of US oil production, but is said to be more flammable because it contains a larger proportion of volatile propane and butane. 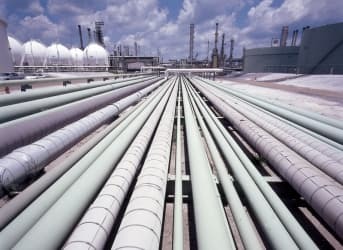 Pipelines have been unable to keep up with transport capacity, which has led to a recent increase in the use of rail for transporting crude oil to refineries. According to the Association of American Railroads, petroleum products was the fastest-growing segment of rail shipments last year. The residual fallout of the North Dakota derailment has been a drop in stocks for Bakken producers and rail shippers.